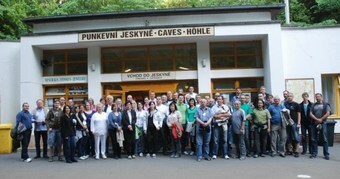 On 24 – 25 May 2012 the traditional conference of representatives of ZKL authorized distributors was held at hotel Skalní mlýn in South Moravia near the famous Macocha Abyss. The event was once again attended by foreign representatives of ZKL authorized distributors from Hungary, Poland and Austria. Formal program of the meeting, in which members of ZKL Group presented to authorized distributors the information about the sale of bearings, the position of ZKL in the market or the status of innovation process in ZKL Group, interchanged an informal part of the afternoon program. Intensive introductory part of the meeting was concluded by the final discussion where our business partners presented important ideas and information which will help to further development of our mutual cooperation. Informal part of the conference connected with the guide tour of world known Macocha Abyss and Punkva caves continued with individual discussions about other interesting projects. During the evening even the dance floor was not empty. The microphone for singing was used not only by members of participating band but also by other people from whom one would perhaps expect. This year´s conference of ZKL authorized distributors was successful and all participants, as we hope, carried off a lot of important information and good feeling from the mutual meeting. We are looking forward to another successful meeting with our business partners in the year 2013.